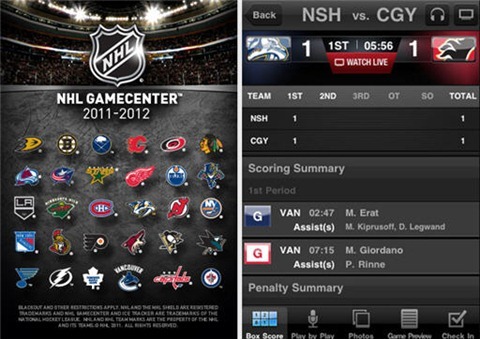 Follow the NHL this season with the NHL GameCenter 2011-2012 App for iPhone or iPad. The free version of the app will give you scores, schedule, play-by-play, news, stats, standings, photos, player profiles, game alerts, 3D Ice Tracker, and the ability to set your favorite team. By upgrading to the PREMIUM version of the app you’ll will get In game video highlights, Live Game Radio, condensed game videos, and some additional video content including Quick Picks & Best of the Week. 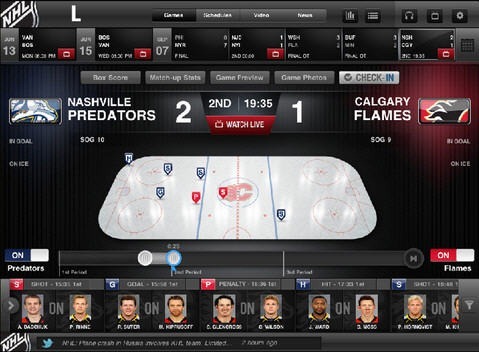 You can also watch NHL out of market games LIVE on your mobile device either by upgrading to NHL GameCenter Live ($159.99 – Free app to Live or $139.99 Premium App to Live)) or by logging in with your username & password if you are already a NHL GameCenter subscriber. Confused? Yeah, it was kind of a mess as they originally released the premium app briefly last week. They then pulled it from the App Store for some reason and re-released it this week as essentially two separate apps with an optional in-app upgrade to the Live version.